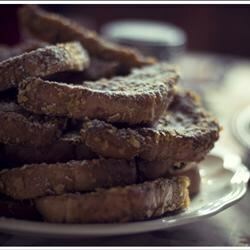 "I first ate this French toast in a coffee shop in Galveston, Texas. After I'd tried it I couldn't wait to come up with my own version. It's great for a late brunch; especially when topped with syrup, fresh strawberries and whipped cream"
Heat deep-fryer to 375 degrees F (190 degrees C). In a large bowl combine eggs, milk, sugar, cinnamon and vanilla; beat well. Place cornflakes in a separate bowl. Dip bread slices in egg mixture and press into cornflakes. Carefully slide coated bread slices into hot oil. Fry on each side until golden brown. Drain on paper towels and serve hot. I have been making this same recipe for years and love it. I don't measure, just add a little of this and that. Thanks for submitting it, Donald. I made this recipe for my daughter and myself, and we did not like it at all. it was very good i just used a little less milk.